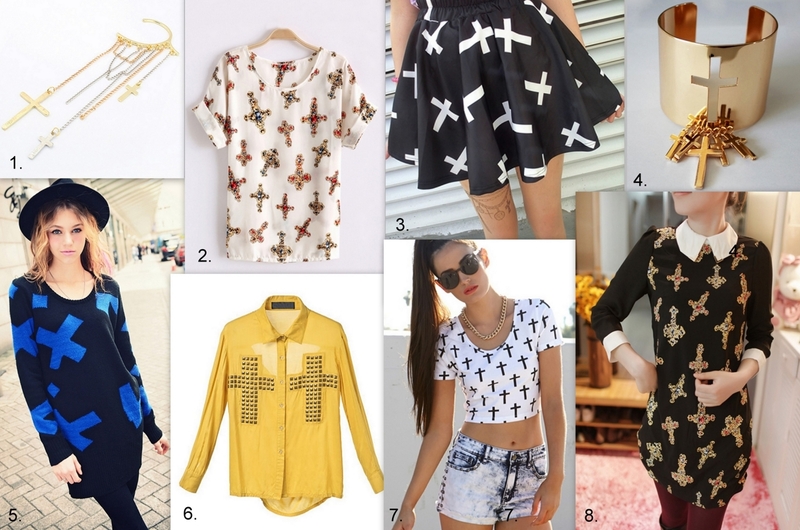 These days it’s hard to miss the cross trend that has emerged onto the fashion scene recently. Starting with the rosary bead comeback and now the symbol is on every ring, bracelet and top in the shop's. You just can't afford not to purchase this season's cross trend. This print seems to be controversial, because of its deep symbolic meaning. What does the upside down cross mean? Historically, it is the cross of St. Peter or Simon Peter. Peter was one of the original 12 apostles that followed Jesus Christ. When Peter was sentenced to death by the Emperor, he requested to be hung upside down. Peter felt that he was not worthy to die in the same manner as Jesus Christ did which was on a cross right side up. 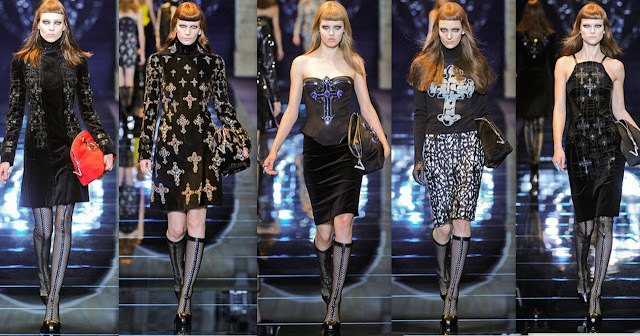 If you don't know how to wear this trend, get inspired from Versace collection. It's edgy, it's rock chic and really classy. I leave you with also with my combination, I have paired Oasap cross printed shirt with vintage leather skirt. Recientemente en la escena de la moda ha surgido con toda la fuerza un nuevo estampado de cruces. El símbolo podemos encontrar en cada anillo, pulseras y muchas partes de la ropa. Es un must have de esta temporada. Pero toca ver que este estampado es un poco controversial, debido a su profundo significado simbólico. ¿Qué significa la cruz al revés que vemos por todas partes? Históricamente, es la cruz de San Pedro que fue uno de los 12 apóstoles originales que siguieron a Jesucristo. Cuando Pedro fue condenado a muerte por el emperador, pidió ser colgado boca abajo, porque sintió que no era digno de morir de la misma manera que Jesucristo. Si no sabes como llevar esta tendencia mira abajo las inspiraciones y la coleccion de Versace, que muestra que esta tendencia tiene un poco de rock, pero también es chic y elegante. Personalmente me encanta, por eso decidí comprar mi camisa de cruces en Oasap y combinarla con una falda de piel vintage. Ostatnio na scenie mody pojawiła się nowa moda na krzyże. Symbol ten można teraz znalezc wsrod akcesorii czy odziezy. Jest to must have tego sezonu. Trzeba jednak zauważyć, że wzór ten budzi sporo kontrowersji ze względu na swoje głębokie znaczenie symboliczne. Skad sie wzial symbol odwroconego krzyża? Wgladajac do historii jest to krzyż świętego Piotra, który był jednym z 12 apostołów, którzy poszli za Jezusem Chrystusem. Kiedy Piotr został skazany na śmierć przez cesarza, poprosił, aby go powiesic do góry nogami, ponieważ czuł, że nie jest godzien umrzeć w takiej samej pozycji jak Jezus Chrystus. Jeśli zas nie wiesz, jak nosić ten trend ponizej umiescilam pare inspiracji, m.in kolekcje Versace, ktora pokazuje, że ta tendencja jest nie tylko rockowa, ale również szykowna i elegancka. Osobiście zas proponuje Wam stylizacje koszuli w krzyze z Oasap w połączeniu ze skorzana spódnica vintage. A ty, co sądzisz o tej tendencji? And finally time to shopping! El tiempo de hacer compras! Great tips!! You look gorgeous!! fantastic outfit, hun, the printed shirt is such a great piece and adore your chic styling. Me encanta la blusa y con la falda de cuero logra un buen look. Mnie motyw krzyży nie kręci, ale długością nóg mogłabym się zachwycać godzinami! Me ha encantado la entrada de hoy. Y la faldita que llevas es preciosa. piękny jest twój look! uwielbiam motyw krzyży ! Muy linda y acertada esta combinación. Perfecta de pies a cabeza. ¡Besos! Me encanta esta tendencia y la camisa es muy bonita! Un beso. I love to see the cross motif returning, Aga... so beautifully simple or amazingly ornate, it doesn't matter! Unlike skulls, I can tolerate crosses. In no way am I overly obsessed or excited about crosses, but I'm more tolerant of crosses than skulls personally. Your cross-adorned shirt is very nice along with the leather skirt. The pumps are very nice. And as usual, you have your pretty smile and charming hairstyle. Good looking outfit! You look so fabulous. I really love your top! I love this trend! I think you pulled it off perfectly. such a pretty blouse, and love the inspirational pics!! Nice and that skirt is perfect. Have a great day. What a super cool outfit dear!!! 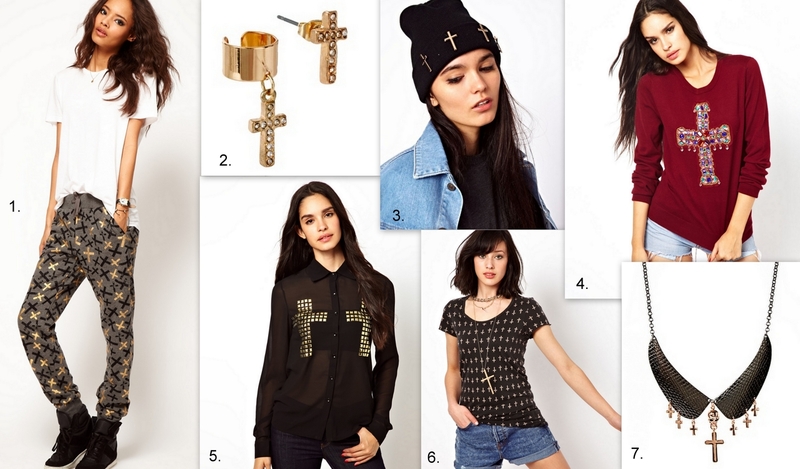 I love the cross trend but I just can't seem to find the right pieces for me :). Very useful post, thanks Aga :)! You look amazing! This is definitely a great way to use this trend. I´m following your blog now and I’ll be honored if u could do the same! just hyped your outfit and cute!! Un post muy, muy interesante; me ha gustado mucho la explicación sobre la cruz. El outfit que llevas es muy chic. NENA, UNO DE LOS MEJORES LOOKS TUYOS!!! Love this look, and the inspirations! Hi dear, thanks for lending me your fashion insight! 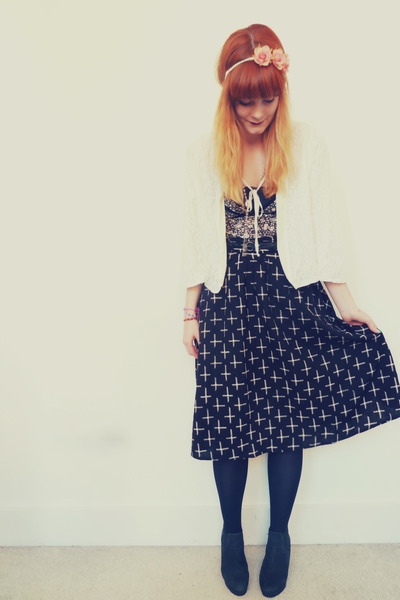 Most tops would surely look great with this vintage leather skirt!!!! Hola!! pues sí!! últimamente no hago más que ver este estampado en todo tipo de prendas!! a mi me gustan mucho los vestidos y las blusas, la que tu llevas me parece muy bonita y queda genial con la falda negra! muchos besotes!!! love a good leather skirt to bring out! babe, what a to die for pair of legs! lovely outfit as well!